Make your own full-bodied hot sauce with this DIY kit that offers a kick from chipotle and guajillo peppers. To add fiery flavor to nachos, chili, pizza, and more, while raising your metabolism, there's nothing like a full-bodied hot sauce--and making it yourself can add an extra kick to the mix. Produce a piquant variety of hot sauces with this DIY kit, offering cayenne, ancho, curry, and chili spice packs. Simply follow the instructions, combining the spices with the included peppers, vinegars, and brown sugar to create your own handcrafted condiments. 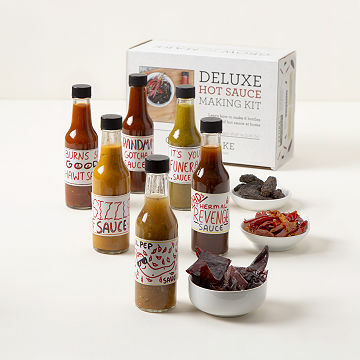 Six bottles and customizable labels let you package and present up to six of your own small-batch sauces that'll turn up the heat on your favorite foods. Made in Portland, OR. Click here to learn how to make hot sauce using your Make Your Own Hot Sauce Kit. The glass bottles elevate this kit as do the less common pepper choices included. Fun to do and a neat hot sauce kit! Hot sauce for the Hubby was a Hit! This hot sauce kit was a perfect surprise for my husband. He's been on a spice kick, and now he gets to make and perfect his own sauces, even naming them! Perfect for your Spicy King/Queen! It was exactly what I needed for a great gift! This is a fun way for hot sauce lovers to get involved in making their own flavors. The kit comes with everything you need and a bunch of bottles so that you can experiment with multiple kinds. My daughter LOVES hot sauce, even carries a spare in her purse! She was super excited to make up her own concoctions. Wonderful gift for my friend and his partner. Only wish it came in more than one size option because he really REALLY like hot sauce! My boyfriend loves hot sauce and he loves to cook and make up his own recipes. So this was perfect! He was so excited when he opened it. This gift is perfect for hot sauce lovers and people who like to get creative!! I personally don't like spicy foods so I can't comment on the taste myself, but I guess how it comes out depends on the maker!